The AQUA SOLUTIONS' Model 2618S2-DW11 is also available with an RO tank: Model 2618S2-DW11-RO. It is also available in High Flow: Model 2618S2-DW. 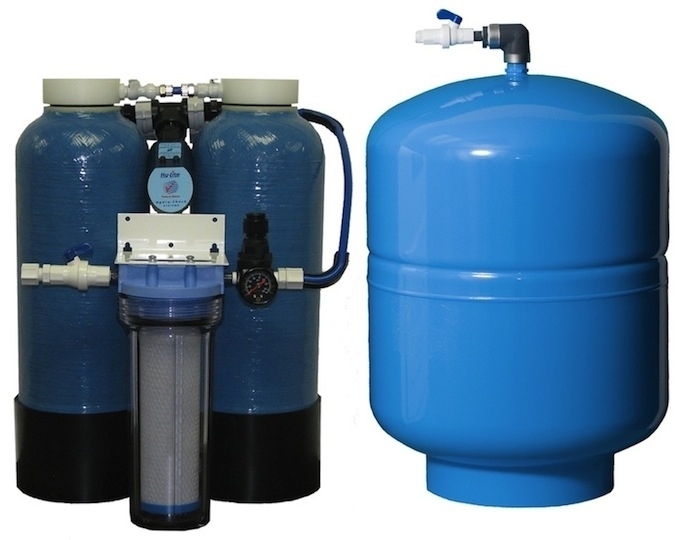 This dual tank 20-LPM Type II/III DI System with 42-Liter pressurized storage tank is designed for applications that require up to 160-Liters of Type II/III DI water/day at a flow rate of up to 20-LPM, when fed RO pretreated water containing up to 20 PPM of total dissolved solids. All AQUA SOLUTIONS' Analytical Grade Type I DI Systems produce purified water that meets or exceeds ASTM, CAP and CLSI specifications for Type I reagent grade water. Ion Exchange Capacity is 6,000 Grains.